With the grilling season fast approaching and your outdoor gas grill still in hibernation, don’t get caught with your tongs down. When friends and family come over on a lovely spring day, make sure you have already taken the necessary steps for fun, friendly and safe backyard grilling. Like any piece of equipment that is tucked away for the winter months, propane grills require a thorough inspection and maintenance before they are ready to cook steaks, burgers, and veggies over an open flame. Rather than make excuses why your stainless steel grill isn’t fully operational, consider taking these measures. Before diving in with cleaning products, grill safety calls for a thorough review of a number of parts. Among the most important are the gas source, hoses, and connections. Start with a visual examination of the following. Fuel Lines and Connections: Check for signs of cracking, abrasions, tears, kinks or bends. Even if no signs of damage are evident, take soapy water and soak the lines and connections before lighting. If there are leaks, you will see signs of bubbling. Replace any vulnerable items before moving forward. Propane Cylinder: After a long winter slumber, your tank could have been impacted by weather changes. Check for signs of bugling, corrosion, rust, punctures or other unusual issues. You can splash soapy water on the tank to see if it leaks. However, replace any tank that gives you the slightest suspicion. Ignition System Battery: Automatic starters are not just a convenience, they are a primary safety device. Once your fuel system is in good working order, test the switch. If it is not sparking the grill adequately, replace the ignition system battery before opting for an entirely new unit. It’s important to follow your reference manual and select correct replacement parts. Exact matches are more likely to provide high-quality results and enhanced safety. 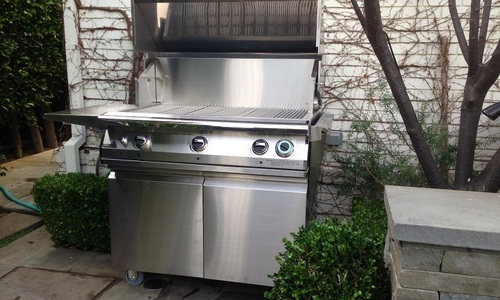 Sitting inactive for a number of months opens the door for the dust to accumulate, even when stainless steel gas grills are appropriately covered and stored. A bigger issue may be spiders and bugs that decided to take up residence in the undercarriage, burners or grates. Start your cleanup by giving the outdoor gas grill a thorough wipe down. Avoid the use of steel wool scrubbing pads or harsh chemicals. These may cause unnecessary scratching and rust. Warm soapy water and a non-abrasive cloth will generally suffice. If the grill has caked on gunk that sat while stored, vinegar with water and a good scrubbing could resolve the matter. Once the exterior is cleaned, it’s time to get under the hood and clean the following items. Stainless Steel Cooking Grate: For a deep cleanse, soak the grates in a mixture of baking soda (1 cup) and vinegar (2 cups) overnight. These elements will break apart caked-on food particles. For ongoing grate cleaning, use a brass and steel wire brush to scrub them. Ceramic Briquettes: Gently remove the briquettes and soak them in warm, soapy water for about 10 minutes. Then scrub them lightly with a nylon pad or tool appropriate for your model. 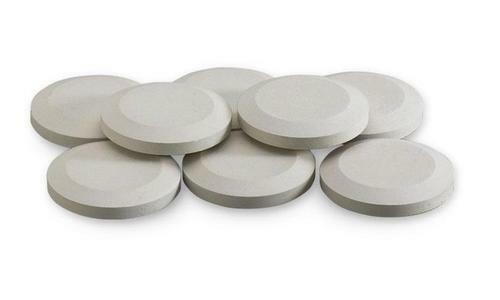 There are specific nylon scrubbing pads made specifically for briquettes. Once they are clean, allow them to thoroughly dry before replacing. PGS Stainless Steel Burner: While the briquettes are drying, these will need to be removed, cleaned and replaced. Check the user manual for the appropriate tools necessary for this process. Use a wire brush to gently remove anything impacting flame holes. A bottle brush may be used to clean inside. From the time you start your visual inspection to putting back the stainless steel cooking grate, consider keeping a pen, pad and reference manual handy. Jot down part numbers that require immediate safety replacement and those that are showing signs of age. PGS grills are well-known for only the best working parts, and it wouldn’t make sense to replace them with anything less. Also, using the correct tools such as wire brushes and cleaning scrubs will help maintain your stainless steel grill’s luster.